California Secretary of State Alex Padilla speaks with unit voting representatives at Base Operations Oct. 16. Padilla visited Edwards to encourage military members to vote and learn about issues effecting their local community. 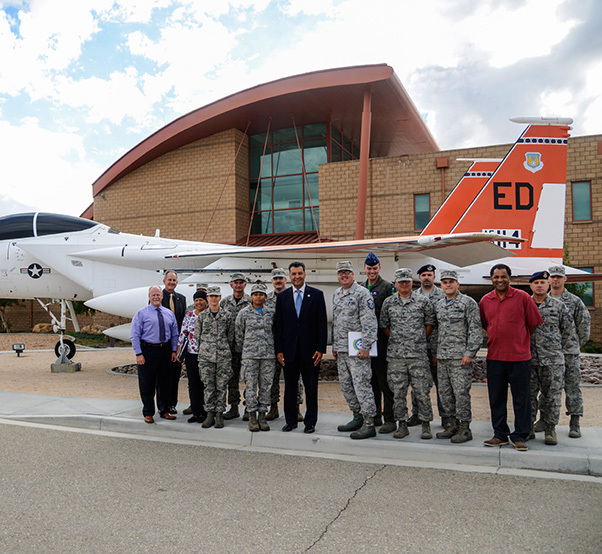 California Secretary of State Alex Padilla dropped by Edwards AFB Oct. 16 to specifically meet with unit voting representatives to emphasize the importance of voting and to encourage all military members to vote, whether they are registered in California or not. Padilla met with the unit voting representatives at Base Operations. California Secretary of State Alex Padilla along with unit voting representatives pose for a group photo at Base Operations Oct. 16. Padilla visited Edwards to encourage military members to vote and learn about issues effecting their local community. He gave reasons why people don’t get out and vote and encouraged everyone to learn the issues and not to just vote in the presidential election. 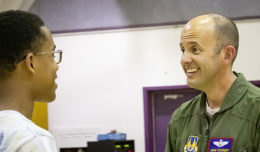 Following the meeting, Padilla was given a tour of Edwards AFB. According the California Secretary of State website, Padilla is committed to modernizing the office, increasing voter registration and participation, and strengthening voting rights.